Shanghai in Western depictions exists, almost to the exclusion of all else, in exoticised form, triggering evocations of sampan flotillas on the Huangpu River, complexes of ‘shukumen’ rowhouses, narrow courtyards and laneways, alleys reverberant with ‘rattles of mahjong tiles and scented with sweet almond broth [and] opium smoke’ (Grescoe, Prologue), sing-song girls, houses of ill-repute and cabarets. Shanghai, divided by Western imperialism as a result of China losing the Opium War (also when the term ‘gunboat diplomacy’ came into use), became a Treaty Port in 1842 and was subsequently divided into three areas of jurisdiction or concessions -- the International Settlement, the French Concession and the old Chinese municipality consisting of Hongkew, Chapei and Nantou. In Taras Grescoe’s recent historical foray —Shanghai Grand: Forbidden Love and International Intrigue In A Doomed World (New York: St Martin’s Press, 2016), Grescoe, a journalist by training, takes on the history of Shanghai, zooming in especially on the period from post-WWI up through the repatriation of many of the above-mentioned figures during World War II. Shanghai Grand opens with the January 28, 1932 blast outside the Cathay Hotel, so-called the ‘Shanghai Incident’ which marked the first skirmish between China and the Empire of Japan, and then telescopes back in time to how the name Shanghai (上海 meaning ‘above the sea’) came about, how it evolved from a fishing village into the “Paris of the Orient” in the 1930s, and today, is one of the most populous cities in the world. Inescapable perhaps are three temporal signposts in the history of post-Manchu Shanghai: the brutal suppression of the Communist revolutionaries by Chiang Kai Shek in 1927, the Shanghai Incident of 1932 and the fall of Shanghai to the Japanese on August 14, 1937 (better known as Black Saturday). For those with some barebones knowledge of modern Chinese history, particularly of the conflicts between the Nationalist government and the Communists as played out in Shanghai, the first seven chapters of Grescoe’s book may read redundant, even simplistic, especially given the existence of other more nuanced and intricate historical accounts, particularly Sterling Seagrave’s The Soong Dynasty (1985) and Stella Dong’s Shanghai: The Rise and Fall of a Decadent City (2000). What makes Grescoe’s historical account distinctive, and perhaps should have been the sole focus of the book, is his investigation into Emily Hahn’s years in Shanghai and Hong Kong (1935-1943), her “marriage” to poet Zau Sinmay, as well as her friendship with Sir Victor Sassoon. Using a research methodology that unearths and examines journal entries, fictional works (Emily Hahn alone wrote 52 books and contributed 181 articles to the New Yorker), private letters, newspaper accounts, historical treatments, photographic evidence, and interviews with progenies of Zau and Hahn, Grescoe pieces together, though there are many gaps, a coherent story of Emily Hahn’s affair with Zau and her years in Shanghai and Hong Kong. Hahn, best known perhaps for her autobiography China to Me (1944), arrived in Shanghai in 1935 and through a fortuitous introduction to a Jewish socialite Bernardine Szold-Fritz, immediately set out to conquer the ‘social swirl’ of Shanghai. It was in fact at one of Bernardine’s salon evenings that Hahn met Zau, and they began their affair shortly thereafter. Zau, a Shanghainese poet and publisher, and a contemporary of Lu Xun’s, cut a dashing figure. He might wear Mandarin robes and sport a wispy whisker, but Grescoe saw in his features a perfect blend of East and West, describing the lower half of Zau’s face thus: “full lips, a square chin and a long, aquiline nose with elegantly raked-back nostrils – loo[king] more Middle than Far Eastern”. Zau was from a privileged background and was educated at Cambridge, although he had to return to Shanghai before he completed his education. However, while in Europe, Zau also spent time in Paris and acquired a sartorial urbanity. In Shanghai, his poetry career led him to be dubbed the Chinese “Verlaine”. He also secured a modern German rotogravure press and became a publisher of glossy weeklies. What old China hands had failed to do with a hundred well-intentioned editorials, Mickey [nickname for Hahn as she was known by her compatriots] achieved by portraying a modern Chinese family – and the travails of the Pans in a Shanghai facing siege – as fully-fledged humans. By the same token, Grescoe also admitted that she was engaged in “appropriation of the most blatant kind,” “trafficking in cultural stereotyping for the amusement of the magazine’s sophisticated readership” and in the process, turning her lover into a caricature. Over time as her love waned, and her opium addiction (which Zau introduced her to) demanded curbing, Hahn began to drift away from Zau. By that time, she had gotten as much as she could out of Zau. 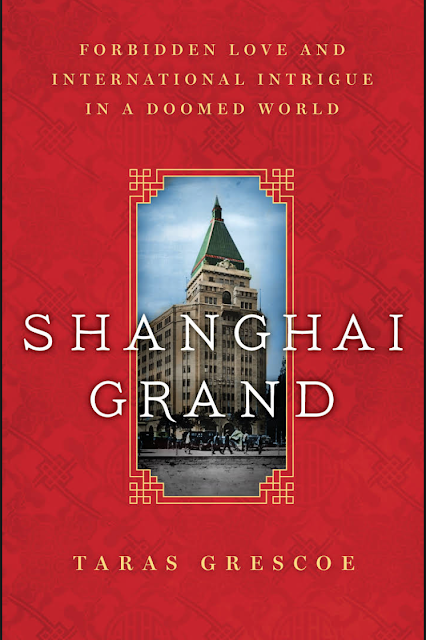 It's Grescoe's glossing over of any ethnocentrism on Hahn's part, his romanticisation of her fascination with Shanghai (testified to by factual or anecdotal evidence in the book) to a degree where there's no historical sensitivity about the "otherness" with which she perceived Shanghai, Zau and his family, that is mildly troubling. More on this point later. gives wild, luxurious and astonishing parties, possesses the only social secretary in the city, and strays away to England or India for no more than the few months the British income-tax laws permit him…He has left his imprint on Shanghai in the towering bulk of his buildings, he has found a sanctuary for his wealth, and he is great. Architectural imprint, certainly. The Metropole Hotel, Embankment House, Grosvenor House, are some of the buildings credited to Sassoon. Sporting a monocle, he walked with a limp as a result of an aviation incident while serving as a sub-lieutenant for the Royal Naval Air Service. He began working in the family's cotton mills and dye-works in India after World War I, already making brief excursions to Shanghai from there. By contracting for the construction of Cathay Hotel and Sassoon House, he began the move of his business interests to Shanghai. The Cathay opened in the summer of 1929; Sir Victor moved to Shanghai in March 1930. These interweaving relationships reach a denouement with the 1937 Japanese invasion of Shanghai. Grescoe is to be credited for his entirely gripping account of Black Saturday, the almost moment-by-moment blow of Chinese bombers dropping their bombs, as the Japanese naval freighter anchored in the Huangpoo -- the Idzumo -- swiveled to begin firing. Two of the bombs dropped by the Chinese aircrafts hit the front of the Cathay and Nanking Road. Grescoe unflinchingly describes the scenes of devastation that ensued. Hahn did not abandon Shanghai in the immediate aftermath of Black Saturday. In the interminable days that followed, Grescoe revivified for us, through the eyes of Hahn, how she helped settle the Zau family in new lodgings as Hongkew (where the family previously lived) became unlivable battleground occupied by the Japanese forces. Hahn also rescued Zau’s photogravure press. In order to do so, Hahn had to acquire legal ownership over the press, which was how her ‘legal marriage’ to Zau came about. This, in turn, was what saved Hahn a couple of years later in Hong Kong from being interned with her baby daughter as the Japanese rounded up all expatriates for concentration camps. As the legal wife of a Chinese citizen, Hahn ironically became Chinese. Shanghai Grand is indeed an engrossing read, as much for the history buff as for those who enjoy a titillating creative non-fiction account. Grescoe brings to the account a cupid curiosity about many things 'old Shanghai' – from the livelihoods of rickshaw pullers to the biographical details of the spy nicknamed the abbott of Shanghai, from Lu Xun’s literary ‘beef’ with Zau to a drink Sir Victor invented which he called the Conte Verde. It's made of 2 parts gin, 2 parts cointreau, 2 parts Vermout Francaise, 2 parts creme de menthe, 1 part lemon and glows green! Will burn the hair off a man's chest. I quoted at some length the descriptions of Zau. In 1935, the relationship Hahn had with a Chinaman was no doubt scandalous. It flushed out the kind of bigotry prevailing at the time, but it also highlighted a particular kind of Orientalism Edward Said warned about later in 1978. Thus, in pointing out that Zau was urbane and complicated, not what you'd expect of a Chinaman, the hidden transcript simultaneously reinforces the notion that Chinamen are unworthy of being loved by a white woman. Zau was an exception because he wasn't a typical Chinaman. Even the descriptions of his Asian features seemed to eviscerate his Chineseness (more Middle Eastern than Chinese). I am not in any way making out a case of racism, but rather that the task of the historian in the re-enactment of the past that involves the OTHER is a peculiar one. If no re-rendering of the past can be strictly objective, does the capture through a contemporary lens (which is the role of the historian) require a depiction of the past as it were (with all the prevailing bigotry of that time)? Does the historian, to be faithful, simply reproduce statements from the past, ethnocentric or otherwise, without a sensitivity or consciousness of particular brands of Orientalism (whether hidden, embedded assumptions or straight-out romanticisation and exoticisation of the Other) residing within text and reportage? What burden does such blank reproduction carry; what gets perpetuated? (And it is curious that Grescoe essentially re-interprets, and even takes some creative licence with, Emily Hahn's time in Shanghai, thus selective filters become questionable automatically.) Perhaps just as a counterpoint, I also read Half A Lifelong Romance by Eileen Chang (1948) recently. Also a love story set before World War II, but the Shanghai we encounter there never uses the word 'sampan' once, or sing-song girls, or alleyways redolent of opium-smoke and rattles of mahjong.